[Published here on January 29, 2015] After decades of a relatively open border policy with its eastern neighbor, the beginning of 2015 saw Lebanon take unprecedented steps to monitor the entry and residency of Syrian nationals. Spearheaded by the ministries of interior and social affairs, the policies are an attempt to regulate the nearly 1.2 million Syrians already in Lebanon — as well as others seeking entry in the future. The first of these measures came in the form of new visa requirements for Syrians and went into effect on January 5, 2015. Despite political pushback and concerns by human rights groups, Lebanese authorities insist this new policy is only the beginning. Prior to the conflict, entry for Syrians into Lebanon was easier than for any other foreign nationality. According to the Treaty of Brotherhood and Cooperation, signed in 1991, Lebanon and Syria share “distinctive fraternal ties” and did not require travel visas from each others’ citizens. The lax requirements meant that borders remained relatively open, allowing hundreds of thousands of Syrian laborers to enter Lebanon seasonally for work. Syrians could enter Lebanon at any border checkpoint using a valid government ID and would be issued a onetime-renewable six month residency for free. At the end of their year in Lebanon, Syrians would have to return to Syria. Palestinian refugees from Syria had to have pre-approval from Lebanon’s government to enter. With the onset of the Syrian uprising in 2011, the policy changed. Instead of returning to Syria at the end of their one year stay in Lebanon, Syrians could renew their residency for another six months through General Security, paying $200 per family member over 15 years old. For Palestinians from Syria, the pre-authorization was lifted, and the transit visa they received at the border could be exchanged for a three month residency, also renewable for free until the $200 yearly fee. Now, Lebanon’s policy has changed once more. On December 31, General Security announced that Syrians entering Lebanon would be issued entry documents based on the proven purpose of their visit. Their stays now fall under eight categories: tourism, study, work, medical treatment, transit to another country, checking on property, visiting an embassy, or being “sponsored” by a Lebanese citizen. Instead of the one-size-fits-all, six month residency they had previously received, the length of stay for each of these categories now varies, and strict documentation is required. The change was pegged as part of a new, three point policy statement that the Council of Ministers approved in October. To manage the refugee influx, the October statement said, the government would seek to decrease the number of Syrians registered with UNHCR (the refugee agency in Lebanon coordinating relief efforts for Syrians), tighten up security within Lebanese territories and lift the socioeconomic burden on Lebanon. General Security’s new residency requirements are the first step of this statement’s implementation. “We’re trying to find out who is trying to come in and why — and this is something we have the right to know,” explains General Security press officer General Joseph Obeid. But the decision has already sparked controversy — some of it based on semantics. Syrian Ambassador to Lebanon Ali Abdul Karim Ali said requiring visas from Syrians violated the bilateral agreements that had kept borders between the two countries open for decades. Speaker of Parliament Nabih Berri and a number of ministers from Hezbollah and the Amal Movement similarly criticized the move. General Security, however, insists that the documents it is issuing to Syrians upon entry are not “visas” and therefore do not violate these treaties. “It’s entry documentation — it’s not a visa. It’s not like an Egyptian coming into Lebanon,” Obeid insists. Although procedures for Syrians entering Lebanon do remain distinct from those for other foreigners, the strict categories, required documentation and limited stay are exactly what constitute visas in other countries. And despite claims in the Lebanese daily Al-Akhbar that the visa policy will soon be retracted, Obeid says the measure will continue to steamroll forward. “There will be no change in this policy. We’re moving ahead with it as planned,” he assures. Beyond this disagreement, Syrians and human rights organizations are worried about what General Security’s new border policy might mean for those trying to flee Lebanon’s war torn neighbor. Noticeably absent from the eight category statement is a provision for refugees — Syrians trying to enter Lebanon after being displaced by violence. According to General Security and to Khalil Gebara, advisor to Minister of Interior Nouhad Machnouk, these “humanitarian entries” will be granted on a case by case basis. Both Amnesty International and Human Rights Watch expressed concern that the measures would limit access to safety for thousands of Syrians fleeing conflict at home. At the time of writing, UNHCR had yet to issue a statement. “We’re still studying it. We’ll let you know more when we get it,” says spokesperson Ron Redmond. Even prior to General Security’s new measures, the refugee influx into Lebanon had slowed dramatically. The number of refugees registering with UNHCR saw a drastic drop in the last months of 2014 — in October and November combined, only 29,477 Syrians registered with the agency, compared with 31,158 in September alone. Even that month produced relatively low numbers compared to the rest of the year — until August, at least 42,000 refugees were registering every month. Part of this drop is likely due to the fact that the active battlefronts in Syria’s war have shifted to the country’s north and east. Indeed, months of clashes in Syria’s western Qalamoun region in early 2014 saw the most concentrated refugee flows into Lebanon to date. As battles shift away from Syria’s west and south into the north, refugee flows into Turkey continue to increase, while those into Lebanon and Jordan have markedly dropped. But even many of those Syrians who made it to the Syrian–Lebanese border at the end of 2014 were having difficulty entering the country. Aid organizations including Human Rights Watch and the Norwegian Refugee Council say that toughening border controls saw “most” Syrians being denied entry. For Palestinian refugees from Syria, entry was nearly impossible — very few exceptional cases were allowed access. Although the new policy specifies entry requirements for non-refugee Syrians, the criteria for those entering Lebanon as refugees are still being developed. “How do we know who’s really a refugee? They could be lying to us,” says General Security’s Obeid. He adds that UNHCR would determine refugee status on a case by case basis, but dodges questions on the specific criteria that would be used to make such a determination. According to Human Rights Watch and Lebanese rights NGO LIFE, instead of taking humanitarian factors into consideration, General Security was allowing entry based on perceived affluence, religion, and origin in Syria. Nabil Halabi, director of LIFE, says that “social discrimination” saw those who appeared to be from a higher social class — traveling in private cars, well dressed, often from the capital — waved through Lebanon’s checkpoints. Nadim Houry, deputy director of HRW’s Middle East and North Africa division, says Syrians with traditionally Christian names received the same treatment. Meanwhile, those coming from Raqqa or Deir Ezzor — eastern provinces in Syria which are now Islamic State strongholds — were facing significant difficulty. Holding legal status in Lebanon isn’t just a matter of convenience; it’s central to almost all aspects of refugee life. Unfortunately, rapidly changing policies, inconsistent implementation, and inadequate dissemination of information mean that many refugees in Lebanon are living here illegally. In September, Lebanon’s government gave refugees who had limited legal status as of August 21, 2014 the opportunity to regularize their stay with General Security for free. Thousands who had either entered illegally or whose legal stay had expired were able to become legal residents without paying the LBP 950,000 ($630) regularization fee. Still, hundreds of thousands of Syrian refugees are not living in Lebanon legally. UNHCR declined to provide Executive with numbers on how many of the 1.2 million registered refugees in Lebanon fall within this category. However, the agency’s planning figures in early 2014 anticipated that over 800,000 Syrian refugees — two thirds of those registered with UNHCR — would be living with limited legal status by the end of that year. With the government’s stricter policies on entry and residency, this number may now be even higher. 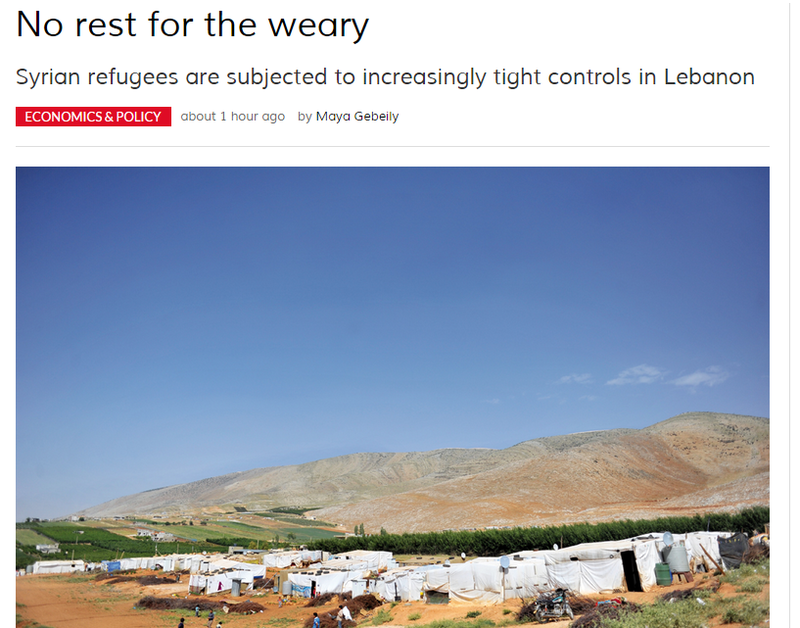 Lack of legal stay severely restricts refugees’ ability to move around Lebanon. In a detailed March report on the topic, the Norwegian Refugee Council interviewed 1,256 Syrians, over half of whom were in Lebanon illegally. NRC noted that over 73 percent of respondents reported curtailed freedom of movement as the biggest consequence of their illegal stay in Lebanon. Fear of harassment by security forces at checkpoints, local municipality police, and even regular Lebanese citizens has kept many Syrians sedentary. Refugees with limited legal status who are arrested by security forces are usually given an order for departure back to Syria, but are rarely forcibly deported. Nonetheless, this lack of mobility has a major effect on refugees’ access to resources. For some, their limited legal status has prevented them from registering with UNHCR. Several refugees who had crossed over illegally from Syria’s Qalamoun region told Executive they felt “trapped.” Too afraid to cross Lebanese Army checkpoints, they could not register at the UNHCR center in Zahle. According to the NRC report, illegal stay has also pushed families towards increased child labor. Male heads of households without legal stay are often too afraid to leave their homes to seek work for fear of arrest. Since children are less likely to be stopped by security forces and asked for paperwork, fathers often send their children to work or beg for money instead of going to school. NRC says this practice exposes children to potential abuse and exploitation. Furthermore, Syrians without legal stay cannot access Lebanon’s healthcare system, and crucially cannot register the birth of their children with the Lebanese authorities. “It creates anxiety, uncertainty. It prevents them from organizing their lives … It’s impacting everything else,” says HRW’s Houry. At the time of writing, the Lebanese government and relevant security agencies had yet to issue decisions on the renewal process for the new visas that Syrians will hold. In their reaction to the decision, Amnesty International announced that refugees who had legal status prior to January 5, 2015, would continue paying the $200 per adult renewal fee as usual, but this has not been confirmed by the Ministry of Interior or General Security. For many refugees, the renewal process presented a significant financial burden. NRC’s report notes that refugee families typically pay $100 per month to rent out a small bedroom in an unfinished building. Securing food costs more than $200 per month, and fuel comes at a cost of $100 per month. Given that the average Syrian refugee family earns $250 per month, according to NRC, the renewal fee is one of the first expenses that families forego when money gets tight. Indeed, the NRC’s March report notes that almost one third of those interviewed stated they could not renew their stay, with 85 percent of these cases saying the cost had prevented them from being able to do so. Others reported that poor treatment and a fear of General Security offices had caused them to skip renewals. Despite the pervasive negative effect that limited legal status has had on Lebanon’s refugees, international aid groups have declined to cover the cost of visa renewal. In 2012, when refugees were nearing their first one year stay in Lebanon and would have to pay the $200 for the first time, aid agencies agreed that they would not cover the yearly fee as part of their support. Now, only one or two NGOs provide the $200 for very extreme cases. “It would be a huge fee. It would potentially contradict our advocacy towards waiving that fee,” says Dalia Aranki, advisor to the NRC’s Information, Counseling, and Legal Assistance Program. A mere 100,000 renewals — less than 20 percent of the refugee population over 15 — would cost $20 million. Refugee and aid agencies alike have said it is difficult to keep up with the government’s changing policies. Some organizations, like NRC, have two tiers of information-gathering: the official government statements about its policies, and the observed and reported practices of security forces. They aren’t always consistent. “If you go to General Security offices, they’ll tell you your kids don’t need to be registered. But then you take them to the border and they tell you you’re violating Lebanese law,” complains Leila, a Syrian refugee living in the Burj al-Barajneh camp in southwest Beirut. NRC’s Aranki says she’s seen the same inconsistency. “You can see how complicated this is. There have been so many changes, and how this is implemented is not written down somewhere in one place,” she explains. Practices differ in areas with different local administrations, and NRC has even had to step in to retrain local authorities who were incorrectly registering Syrian refugee births. Making sure refugees are aware of the legal procedures is no easy task, either. In countries like Jordan or Turkey, where large numbers of the refugee population are concentrated in government controlled camps, dissemination of information can be done much more easily. In Lebanon, refugees live in informal tented settlements, rented apartments, and unfinished buildings — and they don’t always want to be accounted for. “Over the last year, where there has been more tension between the Lebanese and refugees, people have not wanted to make themselves known very much,” Aranki added. Week by week, more details are coming to light about the Ministries of Interior and Social Affairs’ revamped refugee policy. Social Affairs Minister Rachid Derbas has explained that refugees already in Lebanon and registered with UNHCR would not be forced to regularize their stay as part of the new eight category visa. “However, if the refugee decides to go back to Syria and then return to Lebanon, they will have to comply with the new measures and justify the reason behind their return,” Derbas told Lebanon’s As-Safir. Simultaneously, however, Lebanon’s government has been working with UNHCR to deregister Syrians from the refugee list. From June 2014 until October, 68,000 Syrians were removed from UNHCR’s list for crossing back into Syria frequently or failing to pick up aid packages. The Ministry of Interior’s Gebara says that these deregistrations go hand in hand with tighter border control. Both Gebara and General Security’s Obeid promised additional measures in the coming weeks. But several challenges remain, not least the growing political opposition to the new regulations and the lack of clear criteria for “extreme humanitarian” entry cases. For refugees and the aid organizations facing the renewed test of understanding and accurately relaying this policy, the period of tumult isn’t over. “Expect the policy to keep changing based on the security and political situation in Syria,” Gebara says.